Samidoun Palestinian Prisoner Solidarity Network is a signatory of the statement below, initiated by Critical Resistance and members of the U.S. Prisoner, Labor and Academic Delegation to Palestine. We urge groups and activists involved in the prison abolition and prisoner justice movements to add their names to this important document. We are formerly incarcerated people, activists and scholars committed to ending mass incarceration and dismantling the U.S. prison industrial complex. We are deeply concerned with the mounting effort on the part of pro-Israel, Zionist organizations in the U.S. to appropriate a criminal justice reform platform in order to advance the racist ideology and practice of Zionism. 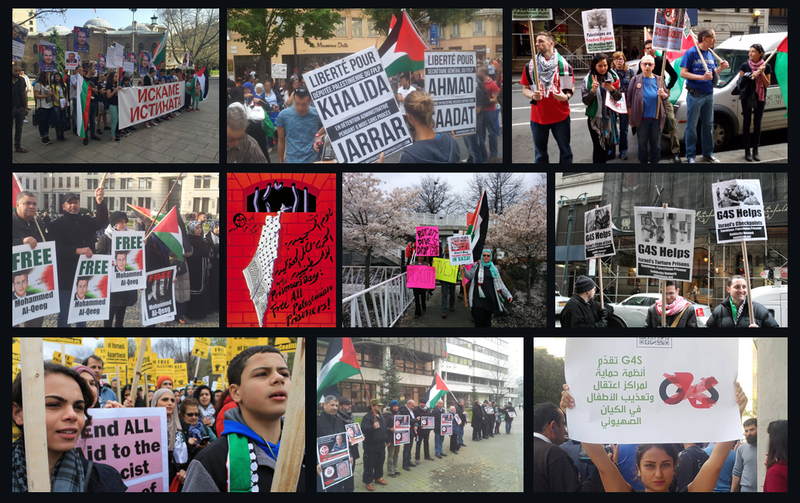 These organizations are using this platform to win prison reform advocates, especially Black and other people of color, to their political agenda of attacking the human rights of the Palestinian people. This subterfuge is particularly hypocritical at a time when Zionist groups have recently mounted frontal attacks against Black leaders such as Angela Davis, Michelle Alexander and Marc Lamont Hill because of their support for Palestinian freedom, and at a time when Israel is brutally escalating their offensive against Palestinians in the West Bank and Gaza. We call upon all those involved in the prison reform and abolition movements to refuse to participate in these dishonest and destructive programs. A case in point is the recent Jewish Council for Public Affairs (JCPA) conference. The conference had panels, speakers and workshops on prison reform side by side with workshops and lobbying aimed at attacking and defeating the grassroots movement for Boycott, Divestment and Sanctions (BDS). The BDS movement was initiated in 2005 to expose the brutal reality of Israeli apartheid and pressure Israel to comply with international law with respect to Palestinian rights and freedom. Israel and Zionist organizations in the U.S. are determined to undermine the success of BDS through a lethal combination of threats, attacks, repressive legislation and cooptation. It is two-faced for Zionist organizations to set themselves up as prison reformers while turning a blind eye to—and covering up—the abhorrent conditions that Palestinians experience in Israeli prisons. Since 1967, Israel has imprisoned over 800,000 Palestinians meaning that 1 in 5 Palestinians have been incarcerated since that time. Some of us have traveled to Palestine and have witnessed firsthand how Palestinian children are tried in Israeli military courts, against international law, and convicted in “trials” conducted in a language they don’t understand. We have learned about the system of administrative detention where Palestinians can be held in prison without charge or a trial for an indefinite amount of time. We have met with Palestinian families whose homes have been destroyed as “collective punishment” after the arrest of a family member. We have understood that Israel imprisons Palestinians in order to suppress their struggle for freedom, just as the U.S. criminal legal system targets Black and Brown communities as a means of continuing their subjugation. Conferences about criminal justice should have formerly incarcerated people as keynote speakers, panelists and workshop presenters. Even more importantly, formerly incarcerated people should be central to setting the agenda for conferences, organizations and the movement for fundamental change against the U.S. prison industrial complex. But we cannot challenge a system that is founded on racism by aligning with Zionism, an ideology and practice rooted in racism against Palestinians. Our struggle can only grow stronger when we join in solidarity with Palestine’s struggle for self-determination and freedom.